If you have kids (or know someone who does) then you might want to make crochet tooth fairy pillows. These are great because they can sit by the child's bed, making a special ritual out of each lost tooth and keeping parents from actually having to dig under the sleeping child's head to pay out the treasure. Here are ten crochet patterns to try for this fun project. Fun fact: August 22nd is National Tooth Fairy Day. Tamara of Moogly created this free crochet pattern for National Tooth Fairy Day in 2014. It is a cute little upside-down tooth pocket with a smiling face that's placed on top of a cozy pillow, designed to be unisex to work for any girl or boy. Coins or dollars fit easily in the pocket. 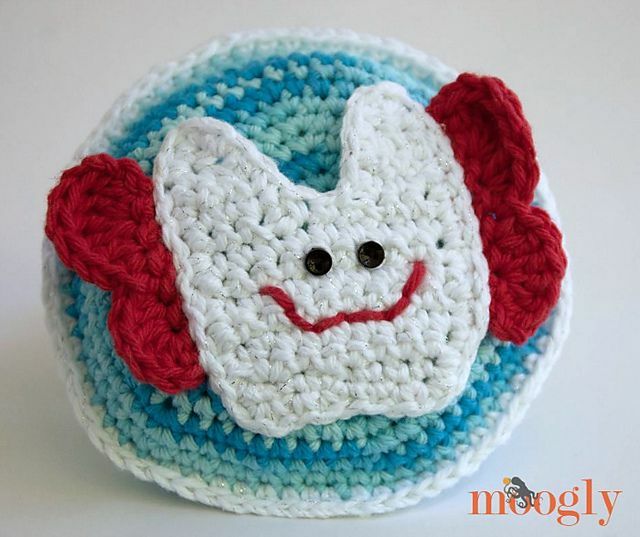 This adorable crochet pattern by Amanda Lang is a crochet tooth that holds the tooth fairy's money deposit in its mouth. The crochet pattern, which is available for purchase through Ravelry, includes information on how to adapt the pattern to make it look like various characters including superheroes, a cowboy and a ballerina. You could use the same pattern for each of your children but make each one just a bit unique. This is a much simpler, more straightforward crochet pouch to hold to children's teeth and the money they're traded for. It's lined and has a snap closure so that nothing falls out. This crochet pattern is for sale from Unseign. This smiling crochet tooth toy has a pocket in the back for the tooth fairy exchange. Yolanda Soto-Lopez shares how to crochet this in her Youtube Tutorial. The free crochet pattern for this simple tooth fairy pouch would be a great choice for a small project or stash buster. It comes from CrochetAddictUK. Here is another simple free crochet pattern for a stash busting tooth pouch. Unlike the one above, this one comes in a tooth shape, which kids sometimes love. However, it doesn't have a button or closure so there's a small risk of teeth/coins falling out. This free crochet pattern is from Angels Crochet. This free crochet pattern by Sarah of Repeat Crafter Me is designed to hang on the bedroom door so that you don't have to risk waking kids up by getting too close to them in their sleep. 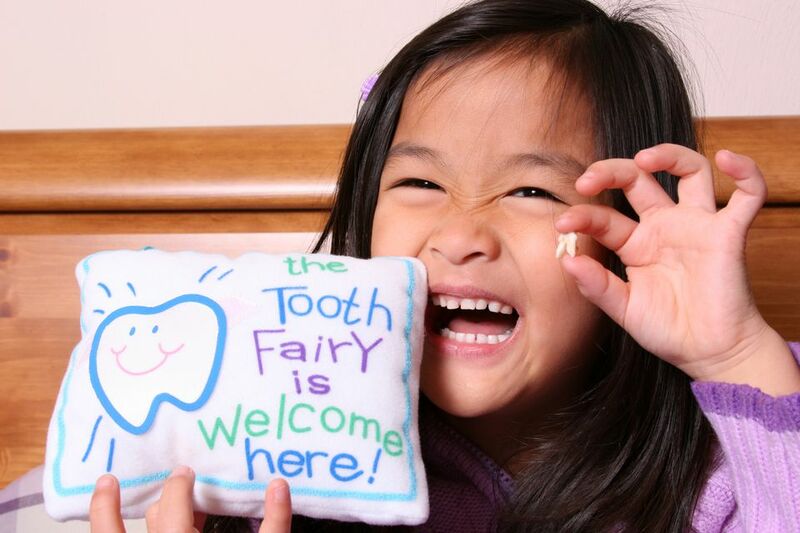 Great choice for light sleepers who might want to try to see if the tooth fairy is real! The big eyes and ​a little bow on this crochet tooth pillow give it a lot of character. If you want a really cute plush pillow that your little one will enjoy squeezing even when it's not tooth fairy day then this is a great selection. Stuffed crochet tooth pillows don't have to be shaped like teeth. Here's one great example - an owl with a pocket for teeth and money. This crochet pattern by Amy Moisan is available for purchase on Ravelry.